Australia hosts some 780 kinds of birds, with the diverse habitats of tropical North Queensland alone numbering an astonishing 450+ species. In this account - Down Under 1 - the first of a pair of two hour DVDs, wildlife film-makers Ann & Malcolm Rymer spend a month getting to know the birds & wildlife of this relatively compact, bird-rich region, documenting a cross-section of common, everyday birds, as well as local endemics & more difficult to find species. '....figgies, firetails & fairy wrens....' highlights the birdlife of various productive habitats in the Cairns area, featuring the Botanical Gardens, Centenary Lake, the shorebirds of Cairns Esplanade, Cattana Wetlands etc. Moving a little further North we bird the picturesque Daintree region, taking a couple of birding trips on the Daintree river & explore the tropical rainforests which clothe the coastal belt. 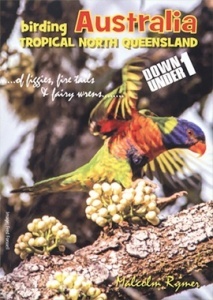 Both DVDs are designed to appeal to first-time as well as experienced, seasoned birders to North Queensland featuring scores of interesting & sought-after birds, landscapes & associated wildlife. Running time : 2 hours - Filmed, presented and produced by Malcolm Rymer.